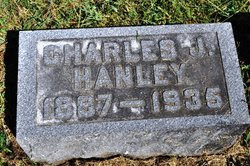 Charles, oldest child of Henry and Mary Jessie Patterson HANLEY, was born 30 May 1887 in Hamilton, Ontario, Canada. In 1894, at age 7, Charles immigrated to the United States along with his parents and siblings. He married Anna Elizabeth PURTEE circa 1907. In 1908 son Howard Samuel was born and in 1910 daughter Lucille Evelyn joined the family. 12 Apr 1935 at the age of 47, Charles died in Detroit, Wayne, Michigan. He is buried in Estates of Serenity Cemetery in Marion, Grant, Indiana.